Probate is the process when the terms of a will are being carried out. Probate bonds are purchased by the executor of an estate -- whether they are named in the will or appointed by the court. The probate bond assures the court and the heirs and creditors of the one who is deceased that all the terms and wishes will be carried out accurately and properly. There are several types of probate bonds that are available to cover different situations and circumstances that may arise during probate. 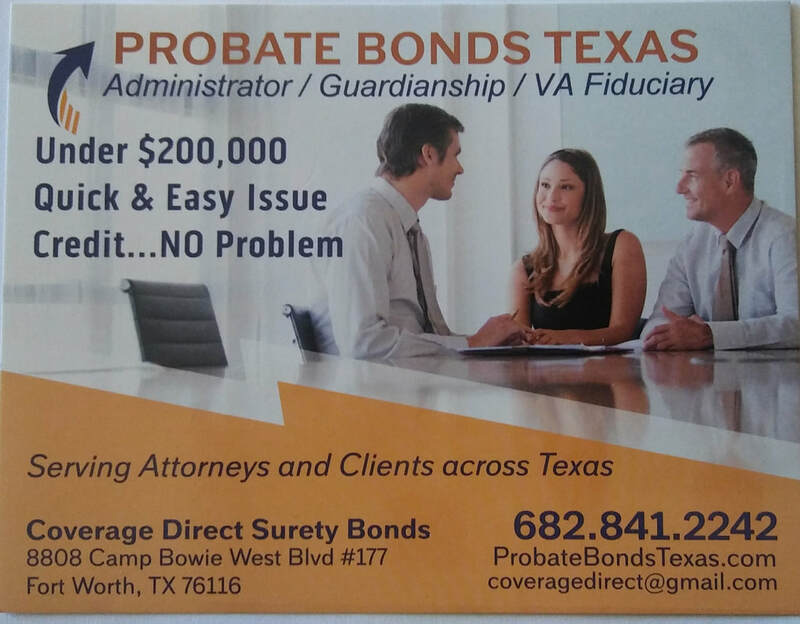 Probate bonds can be purchased at our office. The Probate Bond dollar amount that the executor must purchase is based on the value of the deceased estate or, if the heirs all agree, on the amount of unsecured debts owed. Court Bonds and Probate Bonds must to be purchased from a bond company such as Commercial Bonds Texas and Coverage Direct Once the bond is furnished to the court, the executor can begin the probate process, which usually involves identifying properties mentioned in the will, making a detailed inventory of all assets and debts, giving a value to the estate, repaying all creditors and paying all unpaid taxes owed, and distributing the remaining balance of the estate among the heirs mentioned. Bonds are issued only if the credit history of the executor is really good. Probate bonds are issued for an indefinite period of time and usually cannot be canceled. A Probate Bond Application can be downloaded from the link below.